Healthy Food Guide reveal the winners of this year’s Food and Drink Awards in the July issue of the magazine. Winning products were chosen for their great taste and health credentials. 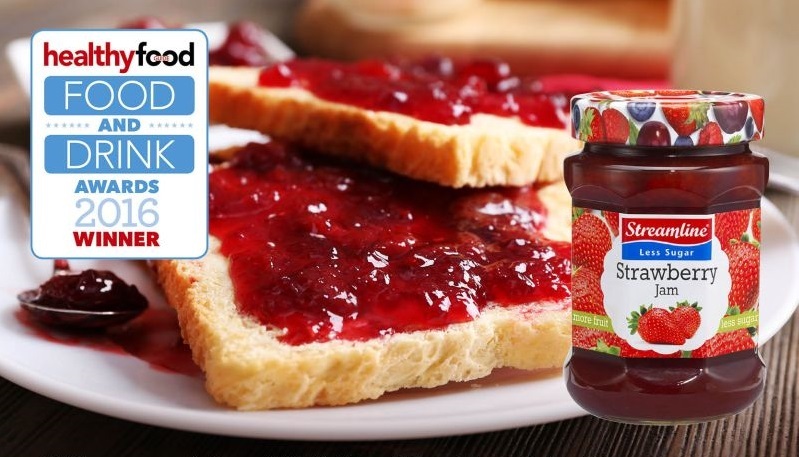 And we’re delighted to announce that Streamline Strawberry Less Sugar Jam has won the award for best product in the preserves and condiments category. So, to help consumers buy and eat more healthily, the Healthy Food Guide team have tasted every product in every category, and the HFG experts have made sure this year’s winners are good all-rounders. The team at Streamline Foods is particularly proud of this award. Right from the start, Streamline has always had a love of pure fruit flavour. We like to do things in the purest and most natural way. So we set out to make the best quality, best tasting jam full of natural zing – which just happened to be lower in sugar too. For us, it’s all about the fruit, the whole fruit and nothing but the fruit. Our loyalties lie with the flavour. We don’t believe in adding more sugar than is necessary. And because health is more than just cutting down on sugar, you won’t find any fake sweeteners or artificial flavours or colours in our recipes either. For details on all the winners and the highly recommended products, see the July issue of Healthy Food Guide.